Star Trek: The Next Generation is coming to Blu-ray for the first time ever this month. And we're all looking back at TNG and realizing all over again what an achievement it was. We were lucky enough to speak with LeVar Burton, who played Geordi La Forge and directed several Trek episodes, about all things Star Trek. Burton opened up to us about his one TNG regret, the Geordi/Data scene you never got to see, and how beautiful it is to see the adventures of the Enterprise-D in their full glory at last. 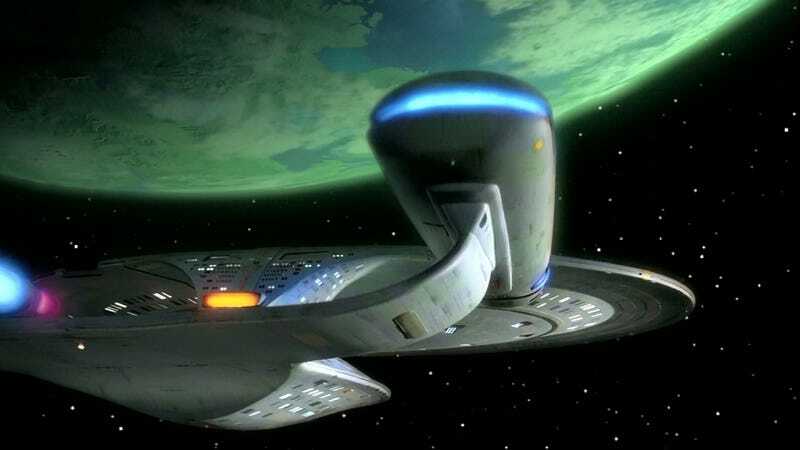 Burton has watched the season one episodes of TNG that have been remastered in full HD, and he says the picture looks "amazing. They have redone all the visual effects, and it's spectacular." When he looks at the engineering set, in particular, it's "unbelievable. I mean, it all pops." Watching it in his living room, in such high was "a sublime experience. It's very cool." A ton of work went into restoring and upgrading these original episodes — but Burton says that it would have been a lot harder if producer Rick Berman hadn't paid so much attention to quality from the very first episode. "I understand at the guys from CBS that it was a lot more work to take the Original Series and transfer it, and make a high-def product out of it. We shot on film in the right aspect ratio, and it makes their jobs a lot easier." Burton adds that there was a "learning curve" to doing the special effects sequences, partly because they were innovating so much. "We were continually the beneficiaries of the advances in technology. So a blue-screen shot in season one took an hour to set up, an hour to light, and a half hour to shoot. But by the time I was directing [episodes of] Voyager and Deep Space Nine and Enterprise, we were popping off blue-screen scenes in 15-20 minutes." No, not at all. But — and this is little-known Trek lore — in the audition sides for the character, during the casting process, there was a scene that Gene Roddenberry wrote between Geordi and Data, that established their relationship. And in that scene, Geordi and Data discussed how Geordi's eyes and Data's brain saw the world in a very similar way. They saw the truth of the world around them. And so, in the scene that Gene wrote, they formed a team, and they called themselves the Perceivers, because their perceptions were alike. And even though the Perceivers thing never made it to the pilot episode, the relationship between Geordi and Data certainly did. And I think that that aspect of Geordi that sees the world around him in a much more truthful manner, and his vision as he interprets it through the VISOR — there's a way that he interprets the world and sees the world slightly differently than the other humans around him, which I think gives him more compassion. That's the one thing I hear from people more than anyone else — that they get that Geordi is a little looser than everybody else, and that he's really more accepting. And I think that accessibility comes from his compassion. Burton adds that he received fan mail from a wide variety of people who were inspired by Geordi — including blind fans and people who were "dealing with physical challenges." But also engineers, and people who had felt inspired to go into engineering after seeing Geordi. He also knows that scientists are working on devices that could be similar to Geordi's VISOR, and this could be yet another area in which Star Trek's technology has become real, from communicators to iPads. Yeah, one [romance] was with an entity that was actually a monster. And the other was with a holographic representation of the woman who designed the Enterprise engines. Neither of which I would necessarily call a healthy relationship. I just wish [the writers] had allowed that part of Geordi to evolve... Because there were a couple of one-line gags that were present in the character — the first one being, "The blind guy flies the ship." And we solved that by giving Geordi a specific area of expertise from which to contribute, when we moved him to engineering. And the other stereotype was that of the nerdy guy, the engineer who is inept around women. And we just never had the opportunity — we ran out of time, I guess — we never had the opportunity to evolve beyond that. And I believe with the core of my being that Star Trek is better than that. Star Trek is better than stereotypes. You have to remember that it was 20th century men, for the most part, writing a show about 24th century people. And finally, Burton says that he's been blown away by the response to the Reading Rainbow app, based on his ultra-successful long-running television show. "It's the next generation of Reading Rainbow, isn't it? It's very cool. I'm excited. Yeah, I'm ecstatic about the response to the app. I'm really proud of the job we did of reinventing the show," he says. The app includes both books and video, which were "the hallmarks, the cornerstones of the television show. I'm very proud of what we've been able to do."